Togadia added Kashmir is an integral part of India and people talking about its independence should go to Pakistan or else face security forces with AK 47s at the border. 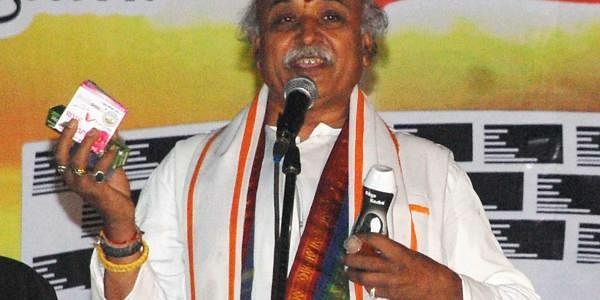 MUMBAI: A day after former Jammu and Kashmir chief minister Farooq Abdullah stated that PoK belongs to Pakistan, VHP leader Pravin Togadia today said those talking about "independent Kashmir" should go to Pakistan. "Kashmir is an integral part of India. People talking about independent Kashmir should go to Pakistan or else our security forces are ready with AK 47s at the border to deal with them," the VHP working International President said on the sidelines of an event here. Abdullah said yesterday that PoK belongs to Pakistan and "this won't change" no matter how many wars India and Pakistan fight". To a query on the controversy surrounding Bollywood film "Padmavati", the Hindu leader said the Censor Board should take a stand on the issue and stop its release. "'Padmawati' was a great queen, why should people protest against the movie based on her life? It's the responsibility of the Censor Board. It should take a stand and shouldn't allow the movie to be released," he said. Various Rajput organisations have been protesting the December 1 release of the film starring Deepika Padukone and Ranveer Singh in the lead, claiming that it is based on "distorted history" and is "hurtful" to Hindu sentiments. To a query, Togadia said Congress vice president Rahul Gandhi's "frequent visits" to temples in poll-bound Gujarat is a "victory" for Hindus. "Rahul Gandhi frequents temples in Gujarat every now and then. I see this as a victory for Hindus," he said. PTI AVI NSK .